Purpose: Government operatives, later fugitives trying to stay alive. Affiliations: Captain Britain, (formerly) S.T.R.I.K.E. 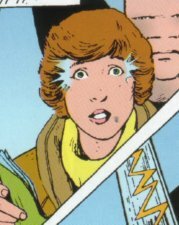 History: (Daredevils#3 - BTS) - A few years after Captain Britain fought Lord Hawk, his sister, Betsy, made contact with another telepath who worked for S.T.R.I.K.E. That organisation was in the process of setting up a Psi-Division similar to the one used by S.H.I.E.L.D. Betsy was recruited and spent a couple of years working for them. A criminal espionage network headed by the crimelord Vixen infiltrated S.T.R.I.K.E. and placed its people in the top positions. The only people who knew this was happening were the telepaths, and so Vixen hired the assassin Slaymaster to eliminate them. Sensing the danger they were in, they went on the run. Four of them were killed by Slaymaster before Betsy sensed the return to Earth-616 of her superhero brother. (Daredevils#3) - One of the Psi-Division, Kevin, has taken a job as a mentalist under the name Doctor Destiny. He was performing his mind reading act at a theatre in London, using his powers to tell what people had in their possession, when Slaymaster arrived, heavily disguised. He asked the blindfolded psi what he had in his pocket, and Kevin telepathically read him. Kevin only had a couple of seconds to react in horror, before Slaymaster pulled the gun out his pocket and shot him dead. At around the same time Captain Britain received a phone call from his sister, explaining that she was in mortal danger and asked him to meet her in Oxford Street. She finished her call to be informed by Vicki, another of the fugitives, that Alison had gone into shock, screaming Kevin's name. Since Alison was in "mindlock" with Kevin, this meant that Kevin had been killed. Betsy and her brother met in McDonalds in Oxford Street shortly thereafter. They barely recognised each other, as both had changed vastly since the last time they met. Betsy explained the situation to her brother, but even as she did so, the disguised Slaymaster had caught up with the remaining telepaths, who were waiting at the Forbidden Planet comic shop down the road. He walked up behind Vicki, who sensed the danger far too late. Slaymaster drove a high tech spike into her skull, killing her, and as he did so, Betsy felt the death of her friend. She informed Captain Britain of what was happening, and he raced to the bathrooms to change. Just before he returned, Betsy sensed the death of Avril. She and her brother raced to the shop, where Slaymaster now had the two remaining survivors cornered. The murderer informed Tom Lennox that he would not have time to concentrate enough to use his telekinesis, but just before he could slay another victim, Captain Britain arrived. Slaymaster, pleased at the new challenge, unmasked to reveal who he truly was. (Daredevils#4) - Tom and Betsy watched as hero and assassin battled it out, communicating telepathically, while Alison remained all but comatose in Tom's arms. They noted that Slaymaster was armed with S.T.R.I.K.E. equipment, a clear indication of the extent that organisation had been compromised, and they wondered what they could ever do against such a powerful enemy. The battle moved outside, and it became clear that Slaymaster was gaining the upper hand. Betsy decided she and Tom must take a hand in helping the hero. She used her precognitive abilities to predict that the battle would move across the street, and back in front of the store, and Tom used his telekinesis to hit the killer with a cloud of comics and magazines, effectively blinding him. This allowed Captain Britain to regain the initiative, and he swiftly defeated his foe. Betsy had a few seconds to talk to her brother before the police arrived. He departed, telling her to get her friends to Braddock Manor. Although the three survivors of this last encounter with Slaymaster make several more appearances, Daredevils#4 effectively marks the end of the S.T.R.I.K.E. Psi-Division. As the situation with Jaspers begins to mount, the problem with Vixen is never brought up again, and by the end of the saga, S.T.R.I.K.E. is no longer around anyway. The last names of Dr. Destiny, Vicki, Avril and the names of the unseen members were revealed in Marvel Atlas#1. SHIELD Psi Division, except that S.T.R.I.K.E. pinched the idea off of them. Vicki Reppion: The exact nature of Vicki's powers is unsure. However she clearly sensed Slaymaster just before he rammed a spike into her skull. She seemed to be young, and looked to Betsy for leadership. Avril Davis: We know virtually nothing about Avril. She doesn't even get a single line of dialogue. She is killed by Slaymaster just after he murders Vicki, making her the last of the Psi-Division to die at his hands. Tom Lennox: The only telekinetic in the group according to Slaymaster. Profile here.